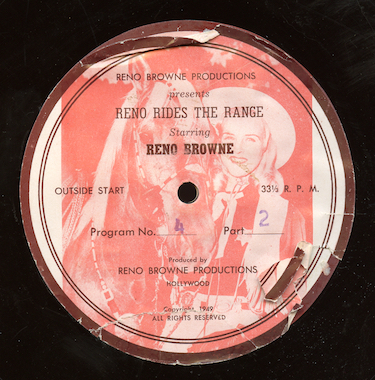 Following up on our previous post, here’s the second half of program four in the Western adventure series, “Reno Rides the Range” featuring Western movie actress Reno Browne. In this episode, Reno is tracking down a killer that is captured by Indians. The program was transferred from an original 16” red vinyl transcription. Let me know if you have or run into other discs in this lost series. Now a real obscurity on the blog. Usually, I don’t post partial broadcasts on the blog, but I can’t find any copies of this show in circulation and it is historically significant. In this post we hear the second half of program three in the series. The plot concerns Reno helping track down a group of outlaws. I've seen information around the web that there were 13 episodes in the full series. 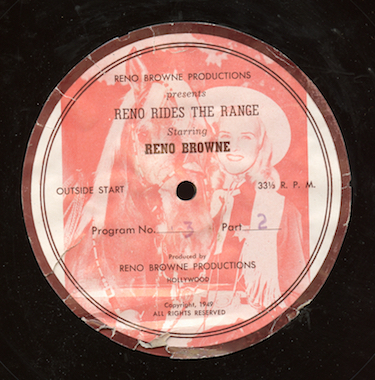 It would appear that Reno syndicated the show herself to local stations where she appeared at rodeos and other events. She passed away in 1991 - the discs might be floating around out there with her family or collectors of Western movie memorabilia. Anyone ever see one? In the next post, the other side of the disc. Here’s another disc of a time-shifted radio program that came in a collection of discs from WHBC, Akron, Ohio. “Adventure Parade” was a kids show that adapted famous stories as a serial in five episodes over one week. This episode of “Adventure Parade” was originally heard Thursday, January 8, 1948 on Mutual and consists of the fourth chapter of “The White Company” by Sir Arthur Conan Doyle. The announcer is John Griggs and the program originated in New York. Unfortunately, the first minute and a half of the show is missing - I guess the engineer didn’t catch it for some reason. Our program was transferred from an original sixteen inch Audiodisc lacquer cut at WHBC. Malcolm Claire was an emcee and storyteller that was a fixture on radio in the mid-west in the late 30s and early 40s. He worked as an emcee for the “National Barn Dance” and had a regular morning series on the NBC network where he told stories for children. In the program of March 10, 1938, Claire tells Russell Gordan Carter’s story, “The Little Men of the Mountains”. Larry Larson is heard on the organ. The show broadcast on NBC-Red from 7:00 am to 7:15am and was sustained; it contains the NBC chimes and an announcement that the program originated in Chicago. According to Goldin's website, there's only one other broadcast from the series in circulation, dating from 1940. The mp3 was transferred direct from an original single-sided sixteen inch NBC lacquer. Here's an unusual bit of radio and Hollywood history, an audition for a children's radio series based on popular animated cartoons. "Sally in Hollywoodland" was recorded June 3, 1947, and is a half-hour kid's show based on the Walter Lantz cartoons, featuring Woody Woodpecker, Andy Panda and the gang. The audition includes announcements on how the show could be sold to potential sponsors. I've done quite a bit of searching on this one, but haven't turned up anything on the origins of the audition or information on the company that produced it. The show didn't appear to actually go into production and syndication. 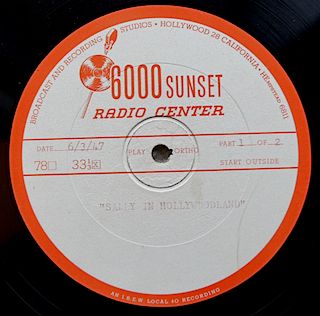 The program was transferred from an original 6000 Sunset Radio Center (Hollywood) vinyl transcription disc, matrix numbers SUN-535A and SUN-536B. If anyone has some more info on this one, I'd appreciated hearing from you! 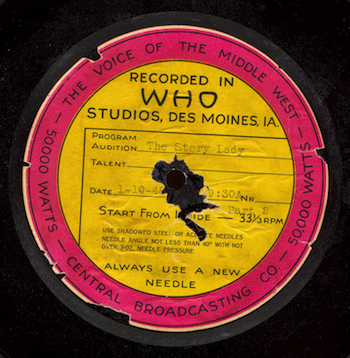 "The Story Lady" was a local children's program on WHO, Des Moines, Iowa. In this post, we hear the last fifteen minutes of the broadcast of January 10, 1948. The show includes birthday greetings, songs, a segment where the kids try to come up with names for pets of listeners, and a child in the audience with a bad cold who coughs up a lung during the broadcast. Our program was transferred from an original WHO single-sided lacquer. The disc came from a group of local programs from 1948 heard on stations around the country - I think they may have been entries in some type of contest for local programming. A few weeks back, we heard an episode of a rather obscure children's series, "Once Upon a Time", syndicated by Standard Radio, Inc in Hollywood in the 1930s. 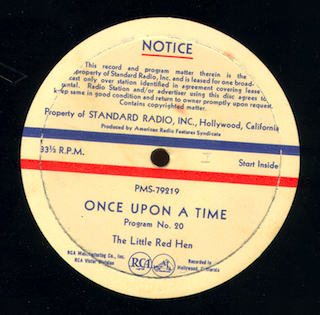 Here's the other side of the disc, program 20 in the series, "The Little Red Hen". This particular episode is rather curious - it reminds me of the vocalizations and style of a later children's show, "The Wormwood Forest", that originated at WSM in Nashville and was heard on NBC circa 1949. 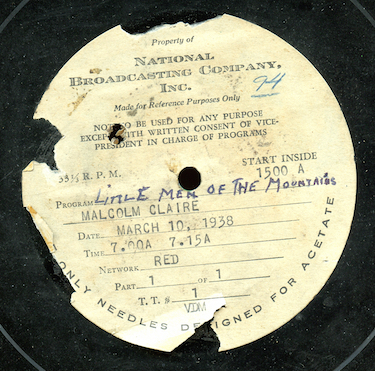 The show was transferred from an original Standard Radio vinyl transcription pressed by RCA, matrix number PMS-79219. Many thanks to Michael Utz for his donation of the disc to may collection! Here's a little curiosity donated to my collection by Michael Utz. 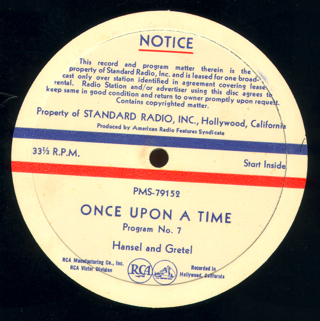 It's "Once Upon a Time", a series based on famous children's stories and syndicated by Standard Radio, Inc in Hollywood. Program 7 is "Hansel and Gretel". The style of the shows, particularly the one on the flip side of the disc that I'll post another time, reminds me of "Wormwood Forest", an NBC show from 1949 that originated at WSM in Nashville. I've done some digging, but haven't been able to verify the date of the show. Goldin and otrsite.com date the program to 1938, but I've not run into newspaper listings for it. WOR had a half-hour show by this title between 1937 and 1939, but it could be a similarly named program done by the Federal Theater Project that ran for a half-hour. The show was transferred from the original Standard Radio, Inc, Hollywood, vinyl transcription pressed by RCA, matrix number PMS-79152. Here's the second, and last, program I have in the previously "lost" children's series, "The Story Princess". The show was carried on ABC in 1958 and '59 and was hosted by Alene Dalton who created the "Story Princess" character for a local Salt Lake City station in the early 1950s. Program 2 in the series as broadcast on the Armed Forces Radio and Television Service includes "Androcles and the Lion" and one of those bizarre Little Orley stories, this one where he has an experience with a magic feather. The show is dated August 15, 1958 in the disc matrix, so that's probably the original ABC radio network broadcast date. The show was transferred from an original vinyl microgroove AFRTS transcription. And now a special piece of local old time radio history, previously unheard since it was originally broadcast. I posted to a couple of mailing lists about the show, but couldn't turn up any more info on it, so what I have here is based on the disc itself. "Mystery Castle" was a local serial adventure show from WKBN in Youngstown, Ohio. Run during the holiday season, and probably inspired by the success of "The Cinnamon Bear", the program follows the adventures of a boy and girl in an enchanted forest as they try to figure out "mystery packages" hidden around the forest. The show was sponsored by a local department store, Stambaugh Thompsons, and if you were a young listener you were encouraged to have mom and dad take you down to the store to buy your own "Mystery Package" (for only 25 cents!) that you can open as you follow the program. The store also had displays featuring characters from the show. Episode 9 of the series has Happy and Ronny stealing a special key from Santa that they hope will open one of the mystery packages in the castle. It includes the original Stambaugh Thompsons commercials at the beginning and end of the program. The show was written by Ellamae Casteel, produced and directed by Chick Lynn and the sound effects were by Howard Rampus. There's no date on the label, but a sharp-eyed listener to the blog spotted entries for the show in the WKBN schedule listings in the Massilon, Ohio Evening Independent showing that the series ran in December 1947. Jay Hickerson noted that Clay Cole, host of an influential New York rock and roll tv show in the late 50s and early 60s, mentions in his autobiography being part of the cast of the program when he was a child. WKBN, according to Wikipedia, was founded in 1926 by Warren P. Williamson, Jr. and was Youngstown's first radio station. Early on, the station became an affiliate of the CBS radio network and remained so until the station was sold by the Williamson family in 1999. Currently, WKBN is one of many stations owned by Clear Channel Communications. Our program was transferred from an original lacquer transcription from WKBN, Youngstown, Ohio. The show is previously uncirculated among otr collectors and appears to be the only surviving episode of the series. Update: See the comments for detailed info on the show from readers of the blog. The local paper in Youngstown, the Vindicator, has made a post on their blog seeing if any locals remember the show and looking for more info.